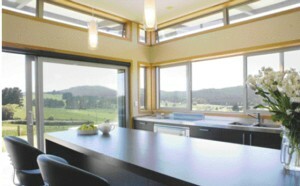 A gusty hilltop site and the desire to minimise energy consumption caused a North Waikato family to build a passive solar benchmark. When a former dairy farmer and his wife decided to come off the land, they didn’t have to go very far. Having carved a 1.3-hectare section out of their larger holding, they proceeded to plan a new house to sit on the lofty site. Their interest in sustainable building styles had been bubbling away below the surface for many years: they’d used solar power to run the milking shed for years and had earlier investigated converting the farm into an organic operation but found it unfeasible. Their home-building research took them to an Auckland home show where they met eco-minded designers Milti Stefadouros and Duncan Firth, while on the internet they found the design company Powered Living, which specialises in passive solar design. As it turned out, Milti and Duncan act as the northern arm of Nelson-based Powered Living. It was just meant to be. The couple’s brief to the designers was for a simple dwelling that would be comfortable to live in year round and economic to build using local tradespeople and offthe- shelf environmental technologies and materials. It would also be cheap to run and draw its design inspiration from the landscape. They wanted a family home that conserves energy and aims to achieve an internal temperature of 17–24°C, thereby eliminating about 70 per cent of their power bills. The resulting house has long eaves that run the length of the building and, according to the designers, attempt to express the horizontality of the rolling landscape typical of New Zealand. The backbone of the house is a concrete block wall, acting as a solar heat sink and dividing the house in two: the sunny northern side and the exposed southern side. (“As a dairy farmer, I feel right at home with breeze block,” jokes the owner, referring to the building material commonly used in milking sheds.) The wall runs along the hall and is beautifully finished in a tinted sealer coat, which gives it a mellow charcoal finish. Of course, using large glazed spaces on one side of the house satisfied another of the owners’ needs: to retain the sweeping elevated views that range across the surrounding countryside. The main solar heat store of the house is a polished concrete floor, insulated with polystyrene, which runs along the northern side of the house. The angle and width of the roof’s overhang were carefully designed to allow for the correct sun admittance both in winter and summer. “The only problem is that in winter in the North Waikato you can get days on end of fog, so the sun doesn’t get a chance to get through,” says the owner. There is a gas fireplace in the lounge, which is used a handful of times during the year and usually only for the visual effect rather than the heat it provides. The house is insulated by woollen batts with an R4.6 rating in the ceiling and R3.6 in the walls. The windows and sliding doors are all double glazed (except one in the garage). High windows can be opened for cross-ventilation and, in the central hall, high clerestory windows not only ventilate but also bathe the hall in soft light. During winter, southwesterly winds create negative air pressures on the clerestory which assist the passivetrickle air ventilation of the sleeping areas and move air gently and continuously through the house. Rainwater is roof collected and deposited in tanks with a combined capacity of 60,000 litres. It’s then fed through Azzuro solar roof panels. An LPG gas-fed Rinnai heater acts as a backup. Water consumption is reduced through water-efficient tapware and shower heads and waste water is treated on site. The owners currently have a wind sensor installed on the roof to explore the possibility of using wind power. The results so far have been frustrating because, despite the hilltop position, there appears to be no strong prevailing wind. Instead, it seems to swirl around the house, making it difficult to harness. Untreated plantation timbers are used throughout the house, with Lawson cypress weatherboards on the exterior and macrocarpa for interior trims. A soft colour palette includes a main wall colour of Dulux Coral with darker accents of Dulux Cappuccino. Aside from a striking rock garden planted beside the enclosed courtyard and deck, the landscaping is yet to be completed. Even the driveway has had to wait until the erosion-control plants beneath it have had a chance to grow. In the meantime, the owners live in comfort as they watch hawks lazily circle their hilltop eyrie.